The Ford C-MAX is a multi-activity vehicle, or MAV, according to the automaker. It's also the flagship to Ford's dedicated hybrid line which launched in 2012. Available in standard hybrid and plug-in hybrid models, the C-MAX combines style and substance to an already impressive fuel economy range. The heart of that great fuel economy is the vehicles' powertrain. Both the C-MAX Hybrid and the plug-in C-MAX Energi are powered by a 2.0-liter four-cylinder gas engine that's mated to an 88-kW electric motor and lithiu-ion battery pack. An electronically-controlled continuously variable transmission channels the combined 188 horsepower and 129 lb.-ft. of torque to the front wheels. While these are formidable figures, it's the C-MAX range and fuel consumption that really catches the eye not only of the regular car shopper but even the press as well. Both hybrid vehicles are estimated to consume 5.6 L/100 km of fuel in city driving and 6.4 L/100 km when cruising along the highway. In addition, the C-MAX Energi can move on pure electricity alone up to 32 km. And don't think you have to be crawling along the road to do so. Zoom up to highway speeds and watch the Energi stay in EV mode the entire time. The expected fuel consumption equivalent in this mode is 1.9 Le/100 km. In total, the plug-in hybrid beats all competitors with a 1221 km driving range. "C-MAX," says Sherif Marakby, director of Ford's Electrification Programs and Engineering, in a statement, "is the right car for the time as it combines the dynamics and quality of a traditional car with the versatility of a MAV and leading fuel efficiency." Both the standard Fod C-MAX and the Energi come in a hatchback body style and seat up to five. The C-MAX is offered in SE and SEL trim levels while the Energi comes in one well-equipped model. All come packed with a slew of standard equipment. In safety, this includes anti-lock disc brakes, a tire pressure monitoring system, and front, front-side, side-curtain and a driver's knee airbag. Ford's exclusive MyKey is also standard, giving owners the ability to limit the vehicle's top speed and even block select radio and satellite channels. Other standard features of note include active grille shutters for better fuel economy, a tilt-and-telescoping steering wheel and column, and power door locks and windows. 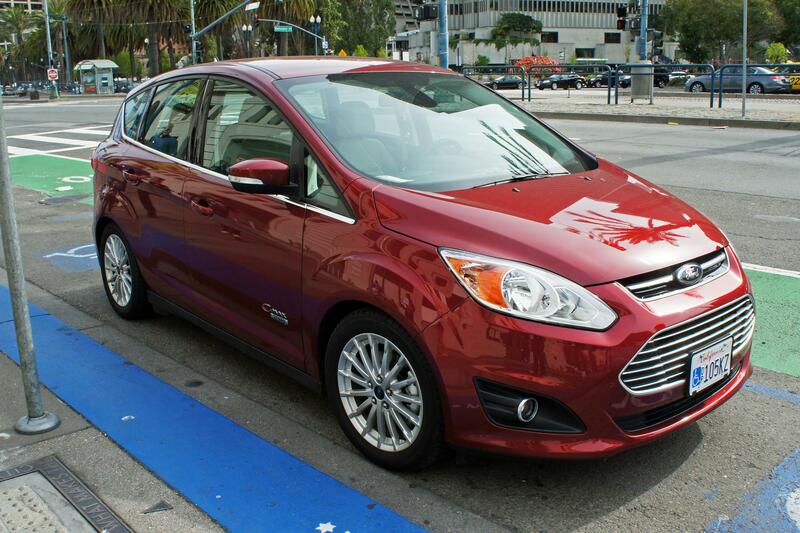 C-MAX SE models build on the standard equipment list with a chrome front grille and Ford's SYNC infotainment system. The SEL builds on the lower trim's features with such niceties as a 10-way power driver's seat and the latest version of SYNC. The Energi gets all the items from the SEL plus a 120-volt charging chord. Option packages are offered at all three trim levels and models. Contact Us to Test Drive the Ford C-MAX!